Unique newly renovated penthouse at the Maalaea Yacht Marina condo complex with private Wrap Around lanai is perfect for watching boats cruise in and out of one of Maui's most scenic and active harbors. 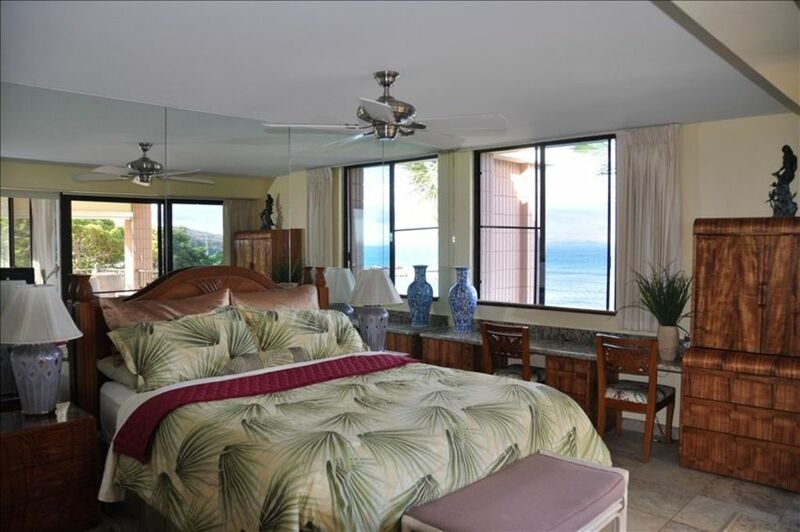 Wake up to unobstructed panoramic views of Molokini, Kahoolawe, Maui's south shore, and Haleakala. With spectacular sunrises and sunsets, this is one penthouse you will always remember. Newly installed central air conditioning units allows you to set the desired temperature in each area of the penthouse to your own personal comfort level. This amenity is only available in the penthouse unit. This tastefully furnished, top floor/corner unit penthouse with 3 floor to ceiling glass walls gives the feeling of being suspended over the ocean! Completely redecorated with a new comfortable California king bed in the master suite, and two stylish twins in the second bedroom. Both have their own private newly updated and remodeled bathrooms. a pleasure while enjoying ocean views. We designed the penthouse with warm tropical colors, granite, original artwork, rare koa wood and one of a kind hand carved furniture. As this is our second home, you will find more than the normal amenities to make your vacation extremely comfortable. Steps away you will find one of Maui's undeveloped three-mile beaches perfect for strolling, bird watching, shell collecting, snorkeling, and all water sports. Walk to eight restaurants, three convenience stores, Maui's new aquarium, shopping center, and multiple boating activities/seasonal whale watching. Lounge on the plush new swivel rockers out on the lanai. From this position you can see the world famous “freight train” wave. You can either admire the world’s fastest wave, or jump in and surf it yourself! At night enjoy the twinkling lights of the sweeping Wailea coast. The mornings are just as spectacular - enjoy your steaming cup of coffee while watching the magnificent sunrise over Haleakala. sunset cruises, whale watching, and sailing charters -- Absolute Convenience! landscaped tropical grounds with native flowering plants. All the amenities of a larger resort, except crowd free, centrally located and reasonably priced! Bill is a retired Fire Captain of over 30 years in the San Ramon Valley Department Located in California. He also builds and fabricates cars speciallizing in hot rods and American muscle classics. He crews for a Outlaw Pro-Mod Car team. After raising 2 sons, Susan runs an office from home. Community volunteer in the library and active in several local associations. Purchased this property for its unique, relaxed and 'old Hawaii' feeling. Centrally located, oceanfront and on whale sanctuary with panoramic views. Love to watch the movement of the boats. toilet, shower, newly remodeled and fully updated! Perfect location to enjoy the view. We felt so lucky to be here. The owners are wonderful for sharing this place with us. Fabulous view from the Lani. The condo is well maintained and very comfortable along with the perfect location. Very well taken care condo in a perfect location. View from lanai is amazing. Despite a busy harbor, it is a very peaceful and entertaining place to watch turtles and whales while enjoying a cup of morning coffee or a glass of afternoon wine or beer. Owners, Susan and Bill, are very attentive and respond quickly. This condo is a gem and we highly recommend it. Mahalo, Susan and Bill! We will be back. This property is a great deal and the view is fantastic.. We "will" make a return trip to Susan and Bill's property.